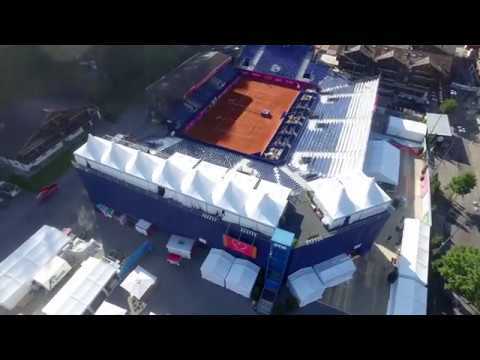 The Beach Volleyball Major Gstaad, the tennis competitions Ladies Championships Gstaad and finally the Swiss Open Gstaad will take place one after the other in the same arena created by NUSSLI. After the beach volleyball players in Gstaad have dusted off the sand, the female and then the male tennis players will be ready for their first serve. The temporary stadium in the Bernese Oberland offers around 4,000 seats and all the necessary infrastructure for a wide variety of sporting events. After the beach volleyball tournament, the sand will be replaced, the NUSSLI assembly crew will swap the benches for the tennis tournament with individual seats and erect additional VIP boxes and camera platforms in the stadium.